Before Sandy Koufax and Bob Gibson were hurling October masterpieces, Bill Dinneen set the standard for World Series excellence. In the 1903 World Series, the hard-throwing right-hander won three games for the Boston Americans against the Pittsburgh Pirates, including the first two shutouts in World Series history. For the Series, "Big Bill" struck out 28 batters in 35 innings, including Honus Wagner to end the Series. Dinneen's triumph in the inaugural World Series proved to be the highlight in a 12-year major league career which saw the right-hander win 170 games, but lose 177. After three consecutive 20-win seasons, in which Dinneen tossed 108 complete games in 113 starts, the overextended pitcher quickly lost his effectiveness and faded from the major league scene. Shortly following Dinneen's voluntary retirement at the age of 33, Alfred Spink wrote, "Bill realized that his pitching arm was gone, and though he might come back for an occasional contest, he could never again pitch ball in his old-time form. He did the wise thing and quit." William Henry Dinneen was born in Syracuse, New York, on April 5, 1876, one of six children of Thomas and Katherine Dinneen, Irish immigrants who had migrated to the United States shortly before William's birth. The most controversial aspect of his life has been the spelling of his last name. Though many contemporary sources and reference works render his last name as "Dineen," this retrospective will refer to him as "Dinneen," based on the fact that the latter is the spelling on his tombstone, death certificate, and in census records. Always a big kid for his age, Dinneen was one of the hardest throwers among his friends, and thus began pitching at an early age. While playing semipro ball in the Syracuse area, he signed a contract with Toronto of the Eastern League as a 19-year-old in 1895. "Big Bill" eventually filled out a six-foot, one-inch frame with 190 pounds, and his fastball convinced the Toronto front office to hold onto him despite an 0-4 record in his first professional season. 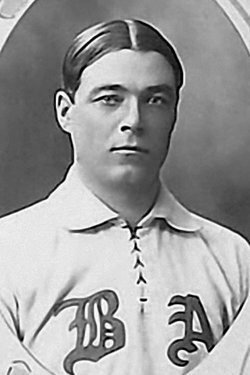 Following an 11-12 record in 1896, Dinneen flourished in 1897, posting a 21-8 record which led the Washington Senators to purchase him for the 1898 season. In his two seasons with Washington, Dinneen won a combined 23 games with an ERA under 4.00. When the National League contracted from 12 teams to eight prior to the 1900 season, Dinneen was sold to the Boston Beaneaters. He posted the first of his four 20-win seasons in 1900, tying for second in the National League with 20 victories, as the Beaneaters finished in fourth place. After a 15-win season in 1901, Dinneen jumped to Boston of the American League, where he enjoyed his greatest success. In his first three seasons with the Americans, Dinneen won 65 games, averaged more than 300 innings per season, and posted a 2.49 ERA. Dinneen was one of baseball's best pitchers from 1900 to 1904, finishing in the top ten in his league each season in innings pitched, starts, complete games, and strikeouts, and finishing in the top five in victories in 1900 and from 1902 to 1904. In 1904, Dinneen set two American League records: most consecutive complete games (37), and most consecutive innings without being relieved (337 2/3), as he finished every game he started for an entire season en route to a career high 23 victories. On the last day of the 1904 season the Pilgrims had a one-game lead over the New York Highlanders. With the Highlanders needing a doubleheader sweep, 41-game winner Jack Chesbro was sent to the mound in the first game. Boston manager Jimmy Collins went with Dinneen. Pitching on one day's rest, Dinneen was the winning pitcher as Chesbro's ninth inning wild pitch snapped a 2-2 tie and gave the Pilgrims their second consecutive American League pennant. Probably because of all the innings he had piled up over the course of his career, Dinneen was never the same following his historic 1904 season. He did have one glorious afternoon on September 27, 1905, when Bill, who had not pitched the entire month because of a sore arm, hurled a no-hitter against the Chicago White Sox, striking out six. He won 12 games against 14 defeats in 1905, and fell to 8-19 in 1906 as he posted ERAs worse than the league average in both seasons. Less than four years after being carried off the field by the fans at Huntington Avenue Grounds as the 1903 World Series hero, Dinneen was traded to the St. Louis Browns in June 1907, for pitcher Albert Jacobson and $1,500. Dinneen was a good athlete. He played in the field ten times in his career, including center field four times, hit a respectable (for a pitcher) .192 for his career and stole 29 bases, including eight in 1901. His main two pitches were a fastball and a sharp curve, and he had textbook mechanics. Baseball Magazine praised his delivery: "A good step helps very much in pitching, and that it is essential to cultivate a powerful body swing, especially to follow the ball well with the arm and the body after it is delivered. Dinneen...has an especially stylish delivery in this respect, and should be a model for youth to imitate." Hall of Fame third baseman Jimmy Collins rated six pitchers among the best he had ever seen. The list consisted of Dinneen and five Hall of Famers: Cy Young, Addie Joss, Jack Chesbro, Walter Johnson, and Ed Walsh. After the trade to the Browns in 1907, The Sporting News noted, "Until (1906 Dinneen) was rated as one of the fastest pitchers in the business, but fell off in his work." With the Browns, Dinneen rebounded and tied for the American League lead with four saves, despite spending just 70 percent of the 1907 season with the club, and posted 14 wins and a 2.10 ERA in 1908. 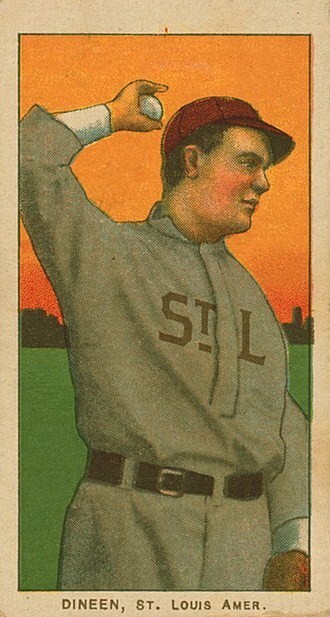 In 1909, arm trouble limited Big Bill to a career-low 112 innings, during which he pitched very poorly. With 170 victories, he knew his career on the mound was finished. However, he did not want to leave the field, so the 33-year-old applied to become an umpire. American League president Ban Johnson agreed to give Dinneen a one-month trial. His final game as a player was August 26, 1909, and less than three weeks later, on September 11, Dinneen joined the American League umpiring staff. The one-month trial resulted in a 28-year job that he held through the 1937 season, which means he was employed in the major leagues for 40 consecutive seasons. Dinneen became the first person to play in a World Series and umpire in the Fall Classic, and is still the only person to pitch a shutout and umpire in the series. He umpired in eight different World Series, 45 games in all. He was on the field for Babe Ruth's called shot in 1932, and six years earlier he was the umpire who called Ruth out for attempting to steal second against Grover Cleveland Alexander to end the 1926 series. Among his other umpiring highlights, Dinneen was the home plate umpire for Ruth's 60th home run in 1927, the first All-Star Game in 1933, and five no-hitters. What type of reputation did Dinneen have as an umpire? In 1922, Dinneen ejected Ruth from a game. The following day, American League president Johnson wrote Ruth a letter stating, "Bill Dinneen was one of the greatest pitchers the game ever produced, and...is one of the cleanest and most honorable men baseball ever fostered." After his retirement from umpiring, Dinneen continued to follow the game. To commemorate the fiftieth anniversary of the first World Series, the 77-year-old Dinneen threw out the first pitch prior to Game Two of the 1953 Series. As The Sporting News noted, "Many present remarked about the snap to the peg with which he started the second game. It wasn't an old man's fluffy toss." He lived in Syracuse his entire life, and was married to the former Margaret Quinn until her passing in 1949. The couple had four children, three sons and a daughter. Dinneen passed away on January 13, 1955, at the age of 78, due to a heart condition. He is buried at St. Agnes Cemetery in Utica, New York.